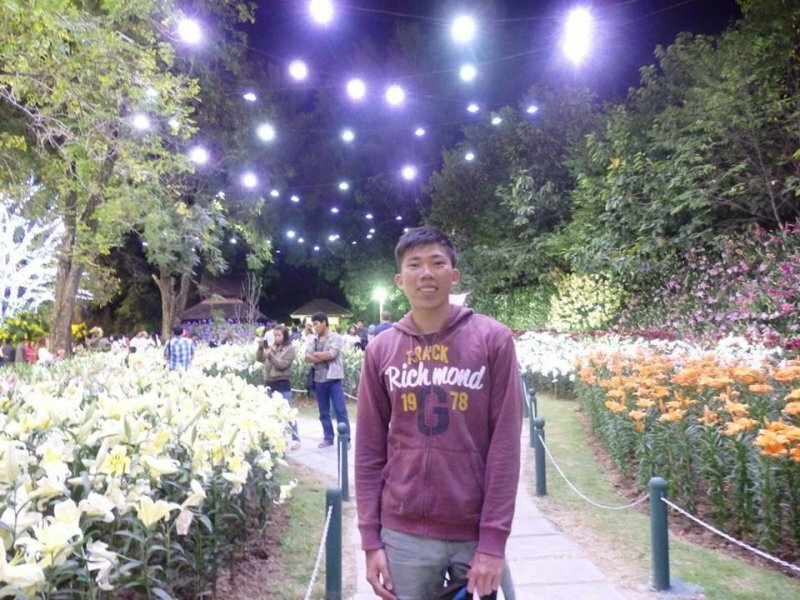 Let us find out how Travel has made Aaron’s life blissful! Hello! I’m Aaron, from Singapore. Data analyst by day, travel blogger by night. I enjoy my day job just as much as I enjoy traveling and sharing my experiences on my blog, and I try to take at least one longer solo trip a year (apart from small trips). 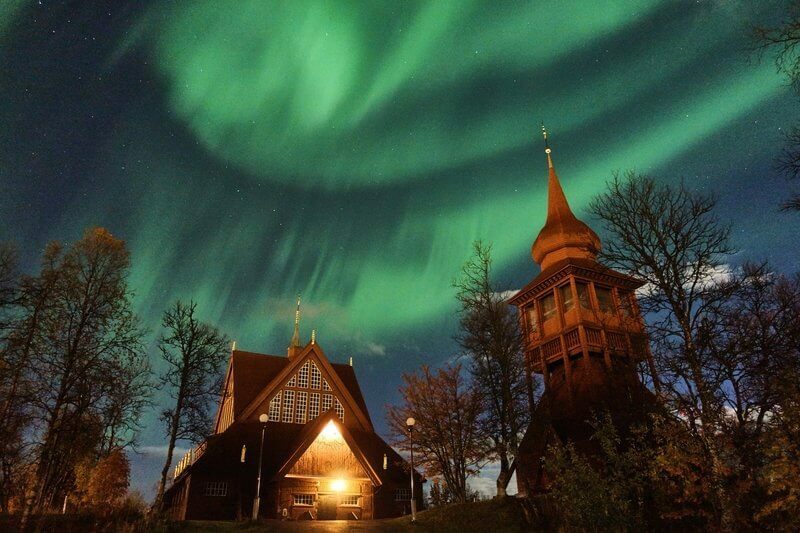 I love to travel to places just slightly off the beaten path, places which offer a balance of adventure, the unknown, accessibility, and some basic comforts, and these slightly off the beaten path destinations have been the focus of my blog. 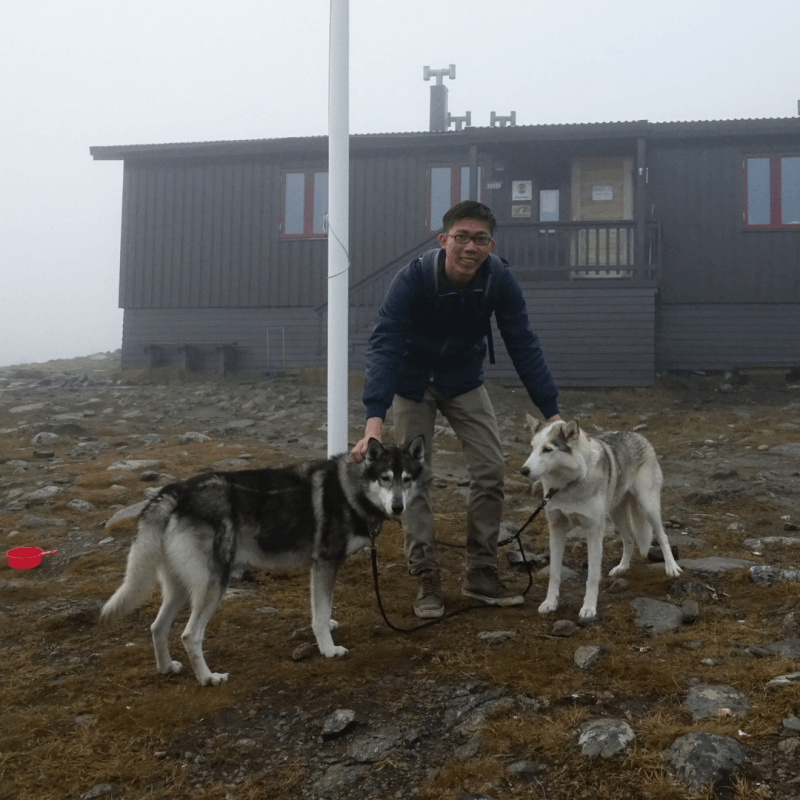 With friendly dogs (friendly owner nearby) at Tjaktjastugan, while hiking the Kungsleden (King’s Trail) in Swedish Lapland, 2016. Four years ago, I’d never have imagined I’d have traveled to to more than a destination a year, much less without the company of my friends or family. In the past three years though, I’ve visited 29 countries, with about half the travelling done alone. In a way, I’ve became hooked. Putting myself in unknown lands and meeting people of diverse backgrounds opened my perspective to the world beyond the little circle around me. With that came a deeper appreciation of everything around, and an uplifting feeling of gratitude and joy. It was not easy getting started. Growing up as an insecure, scrawny kid, I had always depended on my friends to embark on adventures and new things. I didn’t think it would be possible for me to have a good time all on my own. As friends got busier with their own lives, I thought it meant that it would be harder and harder to find happiness. At the Chiang Rai Flower Festival. During my undergraduate studies, I went on an exchange in Europe. I had lots of fun traveling with my friends over the months. We did all our traveling together but nearing the end of our exchange we came to realize that we each had a place we would really like to visit and we wouldn’t have time to do them all altogether. That was when we decided to set out on our first solo trips. It was terrifying, to say the least, embarking on that trip all alone, to a foreign land for the first time. I was in Portugal, on the first day of 2014, feeling a little cold from the winter wind. Just a couple of hours earlier I was catching the fireworks in London with friends before the early morning flight. Everything felt different. Without the comfort and security of friends I could rely on, I was more excited, more frightened, more aware of the surroundings, and more jittery. Despite all that distraction, thoughts became sharper, feelings became clearer, and as I slowly grew at ease with the unfamiliar terrain, I grew more aware of myself. I came to realize what was important to me, what I truly wanted, and what I did not need. 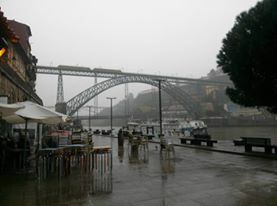 A cold and wet January in Porto, 2014. And I’ve never looked back, grabbing opportunities to explore the world with or without friends whenever I can (most of the more recent adventures on my blog). While I still enjoy having a good time with friends, traveling alone has made me realize that I can have a wonderful time all on my own too. I did not have to depend on anyone else for happiness. With each new destination I visit, and each new friend I make, my perspective of the world broadens and changes. I grew more appreciative of the little joys in life, and of the circumstances which may at first glance seem unfavorable. Traveling, through allowing me to better understand myself and the world, thus paved a path for me to find happiness. Now, having started working life, I continue on my quest to better understand myself and the world through traveling. As time becomes scarce, planning becomes paramount, and I learn to appreciate the time spent traveling alone or with friends much more. Having found the confidence to face the world alone, I find happiness in both my friendships and in myself. The massive Lake Baikal, in Siberia. 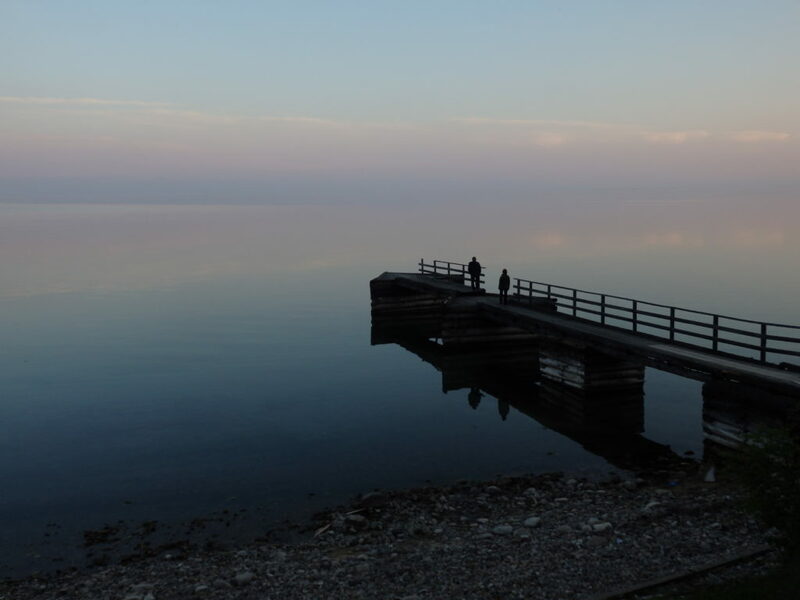 Impressive sights such as the endless and eerily still lake helps to put things in perspective. We’re insignificant specks in the universe, yet we have all that we have, and that’s enough reason to be rejoice! Sometimes, it takes a big leap of faith to discover that the boundaries we had drawn for ourselves actually do not exist, and that leap is all that is needed to break free from the thoughts that have kept us from achieving our bliss. If you ever feel that there is something standing between you and your happiness, I hope you will find your way of leaping beyond it, just as I have found mine through traveling solo.